CAUTION: Unload your pistol before practicing your draw. ALWAYS make sure your pistol is seated properly in your wallet holster before putting it in your pocket. NEVER carry anything else in your pocket with your pistol and wallet holster. Also NEVER holster your pistol while your holster is in your pocket ! A recent addition to the Sig Sauer line-up is the 9mm SIG P365. It is an excellent very small semi-auto that makes for a good concealed carry pistol with a magazine capacity of 10 rounds plus one in the chamber. Amazing! Though the pistol is small, please note that the pistol in my back pocket holster will most likely not fit in regular jeans pockets. It is just a little too tall. You may find that pants such as cargo and carpenter style pants with larger pockets conceal better. Right-handed holsters only. Holster size: 5-7/8 inches tall by 4-1/2 inches wide. Youtube review for SIG P365. For more details on this pistol go here. This holster is for the Sig Sauer P365 with no laser attached. I currently do not have a holster for this pistol with a laser. Maybe later. 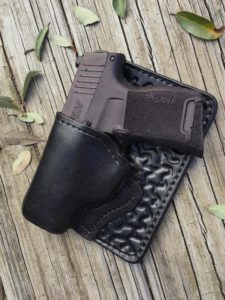 Before making a purchase be sure to check out my Left or Right-hand holster page so that you will be confident that you are ordering the correct holster. Make sure what you think is a right-handed holster is what I consider a right-handed holster. Price is $45.00 (plus $4.50 non-refundable shipping and handling). Texas residents 8.25% sales tax added.